In compliance with NJAC 7:30-9.10 notice is hereby given that the Hunterdon County Road Department will be applying Herbicides for the control of Roadside Vegetation during the months of June through October 2017. During the application period appropriate area wide notifications will be properly posted by means of legal and advertisement Ads, as well as on the Hunterdon In compliance with NJAC 7:30-9.10 notice is hereby given that the Hunterdon County Road Department, Rt. 12 County Complex, bldg. 8, PO Box 2900, Flemington NJ 08822, will be applying Herbicides for the control of Roadside Vegetation on an area-wide basis, as needed, throughout Hunterdon County during the months spanning from Monday April 30, through Wednesday. 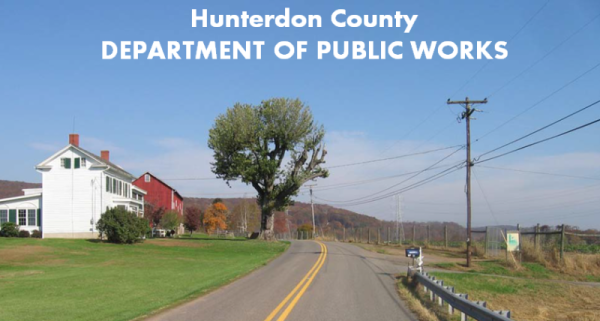 October 31, 2018.Any # route or bridge/culvert within Hunterdon County excluding State of N.J. structures will be maintained within the above dates. The herbicides to be used in the roadside vegetation program will be contact, post & pre-emergence pesticides applied by low volume truck mount and hand sprayers.All persons interested in obtaining additional information regarding Hunterdon County Road Department Pesticide activities are requested to contact Bryan T Manning, Roads and Bridges at(908) 788-1178 as well as (908)236-7770. Upon request the pesticide applicator shall provide a resident with notification at least 12 hours prior to application. Except for quarantine and disease vector control only, when conditions necessitate pesticide sooner then than that time.